Baseboard heaters can add supplemental heat to a room that is drafty or colder than other rooms. They come in different lengths to accommodate almost any room or application. These electric heaters radiate heat into a room and are placed on the outside wall of a home, usually the coldest wall. Baseboard heaters are also used in areas like bathrooms in garages where a little heat would be nice. Baseboard heaters provide a clean, safe and reliable heat source where adding more furnace registers isn't practical. Baseboard heaters come in two different voltage connection styles. The first is a 120-volt connection that can be connected to an existing 20-amp circuit if the circuit load allows it. You may also add a new 20-amp circuit from your electrical panel and feed the new baseboard heaters, which is the preferred method. This wire is connected to a single 20-amp breaker in your electrical panel. The second is a 240-volt connection which also uses a 20-amp circuit to feed it. It requires a two-pole, 20-amp breaker to feed the heater. Either way, #12 wire is the minimum required to feed the baseboard heater. As with any electrical project, turn off the power to any circuit that you'll be working on, for safety sake. 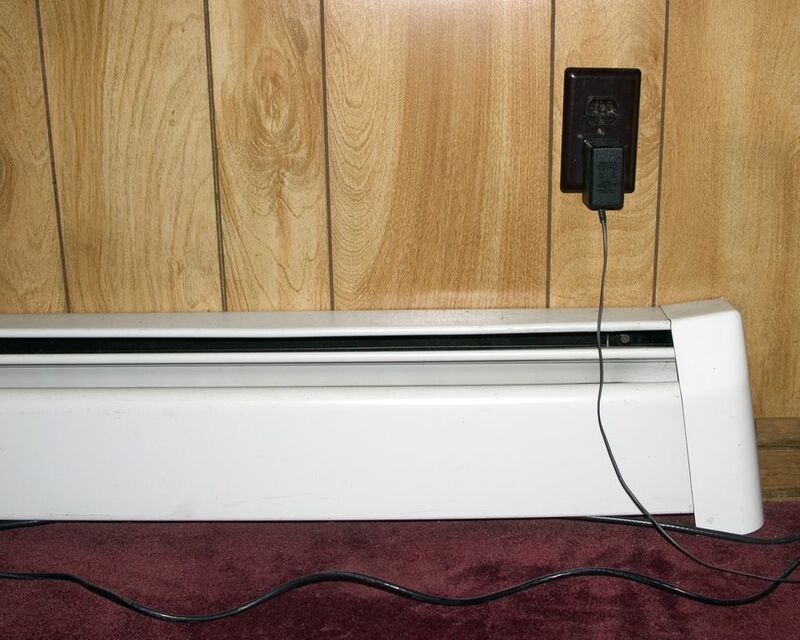 With a few tools, some electrical wire, a baseboard heater, a wire connector, a breaker and some wire nuts, you can install a baseboard heater in no time! Other things to consider when installing baseboard heaters is its location as relating to floors. Your home may have many different types of flooring like carpet, vinyl, tile, or hardwood. Each has its specific requirements as it relates to baseboard heaters. We don't want to place baseboard heaters directly on a carpeted floor that could ignite due to the interaction of the carpet and the heat of the heater. Tile floors are very different and would not be something that would catch fire. Be sure all electrical connections are secure and of the right size. Never try to add too many heaters to a single circuit. Double-check the wattage of each heater and try not to load the circuit over 75%. Baseboard heaters and flammable materials do not mix. Flammable materials should not be stored near baseboard heaters because the heat can cause things like pressurized cans to explode or ignite. Better safe than sorry and store these materials in a cool area within a storage cabinet.